While other technologies are gaining traction in some countries, a German company, NanoFlowcell, seems to have found the magic solution to the problem. They have developed cars which only need saltwater and can travel 2-3 times more than fossil fuel powered cars. How Do Saltwater Cars Work? Saltwater cars work very similar to Hydrogen powered cars. NanoFlowcell have come up with a way to utilize Hydrogen in cars without using high pressure systems. Their cars use saltwater. The saltwater is used to generate electricity and run the cars. If you want to go a bit more technical, the cars have two tanks which are filled with dissolved metallic salts. These dissolved salts have opposite ionic charges which are then pumped through a membrane. There is no question that this is a story that just won’t die, even if 72 bankers in it’s path had to die before the story could get to this point. Hopefully no more will die before the wizard behind the curtain is finally revealed and brought to justice for his or her crimes… however that seems rather distant at the moment. Naturally throughout all of 2014 and 2015, anyone trying to make sense of how 72 high profile banking professionals all died in “mysterious suicides,” was labeled a “conspiracy theorist,” because after all… there’s nothing suspicious about that at all right? It’s nice to see that what some were once ignorant enough to say looked like wild speculation, is now beginning to resemble a vast criminal conspiracy connected to the Libor, interest-rigging scandal as you can read in Jay’s article below. First though, in the following video, Dahboo77 discusses an article by Dave Hodges of the Common Sense Show about the banker death phenomena. In addition to the banker deaths, Dahboo77 brings up the unexpected and sudden deaths of men like Andrew Breitbart, Tom Clancy, and Andrew Hastings (who’s covered more in detail below). In the video you just saw, Dahboo77 claims all of those men went to their graves with stories untold. Was that by design? The next video titled, “Why Andrew Breitbart, Michael Hastings and Tom Clancy were Murdered” certainly makes the case that they were killed because they knew too much. I’m going to go out on a limb and say that anyone reading an article about 72 high level bankers all dead from “mysterious suicides” is open to the idea that Dahboo77 mentions in the first video when he talks about how this is “all tied together,” and how, “it’s so obvious.” There probably was a time when hearing about the global elites’ (also known as the Illuminati) master plan to enslave every man women and child on earth might have sounded like lunacy to you, but no more loony than 72 dead bankers, right? The skeptics can read some of my links at the bottom about HOW some of the dead bankers died. That will erase any doubt. Dahboo77 also talks about moving toward the ultimate goal: One World Government with One World Currency, and he even mentions underground bunkers. New Zealand could become one of the first developed countries to introduce a basic citizen’s wage, while scrapping benefits. Labour leader Andrew Little hinted his party was considering the idea as a way to combat the “possibility of higher structural unemployment”, according to a report by The Independent. Citizen’s income involves a basic, unconditional, fixed payment made to everyone in the country by the state in lieu of benefits. Little says Labour will debate the idea at the back end of March. “The question is whether you have an income support system that means every time you stop work you have to go through the palaver of stand-down periods, more bureaucracy, more form filling at the same time as you’re trying to get into your next job,” Little told Fairfax. “The debate does not mean the policy will be included in the party’s manifesto at the next general election,” The Independent reported Little as saying. Finland and Norway are considering launching a similar debate, while Canada has already debated the issue. Switzerland is due to hold a referendum on introducing a citizen’s income later this year. FIND out what people are saying about this story on our Facebook page. IMAGE CREDITS: WORLD ECONOMIC FORUM / FLICKR. “The purpose of this visit is to renew our bilateral relationship, to give it new life, to find ways to advance the prosperity and competitiveness ofNorth America,” Nieto said, with emphasis added on North America. He’s not the first Mexican president to push the NAU; Vicente Fox also pushed the globalist plan, but he was so vocal about it, the Bush administration finally told him to keep quiet to avoid negative press. And during Fox’s presidency, in 2005, the globalist Council on Foreign Relations met with the Mexican government to discuss the implementation of the NAU. However, the NAU proposal would “increased labor mobility” between the U.S. and Mexico, which would effectively grant amnesty to illegal immigrants, and a “North American regulatory plan” with a “unified approach” to all three countries, which would effectively end U.S. national sovereignty. Additionally, the NAU would strengthen controversial trade deals such as NAFTA which has only exacerbated illegal immigration by fueling mass unemployment in Mexico. Sin maiz, no hay pais: without corn, there is no country, as the Mexican saying goes. NAFTA disrupted Mexico’s corn production so badly that 75,000 Iowa farmers were able to grow twice as much corn as 3,000,000 Mexican producers – and at half the cost because the U.S. maintained its corn subsidies under NAFTA. That resulted in the mass migration of Mexican farm workers flowing into America. “The big wave in illegal immigration from Mexico began in the 1980s, but it picked up strongly after NAFTA – that wasn’t unexpected,” NPR’s Tim Robbins reported, a rare admission from an establishment outlet. Donald Trump has spoken out against NAFTA and EU-style bureaucracies, which explains why Nieto and other globalist Mexican officials have spoken out against the GOP nominee. The unwillingness, on behalf of the Labour right, to unite with the rest of the party and attack the Conservatives at a time when they are politically divided and publicly humiliated neatly demonstrates the unacknowledged truth of British democracy – in fact, most Western democracies: We do not have an “opposition”, we do not live in a “two-party system”. The centre-right Tories and centre-left Blairites are really just two halves of a depraved whole. The Chinese government continues to carry out mass killings of innocent people in order to obtain their organs for transplants, a damning new report claims. 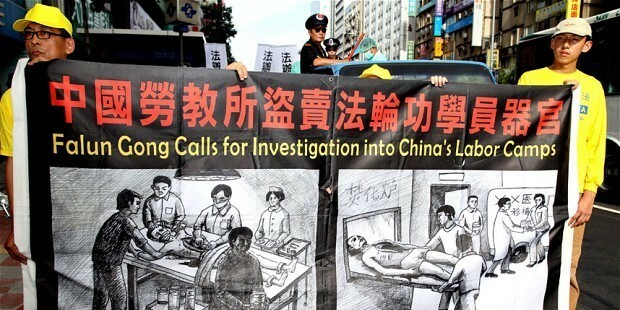 The report – by former Canadian politician David Kilgour, human rights lawyer David Matas, and journalist Ethan Gutmann – shows that organ transplants are carried out in China 10 times more than official government figures reveal. Last week, a US congressional joint subcommittee convened a hearing on the illicit organ transfers, just two weeks after the House passed a resolution urging Beijing to stop harvesting organs from prisoners of conscience. Testifying before Congressman Christopher Smith and Dana Rohrabacher, investigators presented their findings.